Black spot, Diplocarpon rosae, is one of the most common diseases of roses. Wet conditions during warm weather causes the fungus to become active. It takes only seven hours of a wet environment during temperatures of about 75 degrees Fahrenheit for the fungus spores to germinate, and symptoms will appear on the bottom leaves of the rose within days. Roses are especially susceptible to black spot in the spring, when the leaves of the rose bush are less that two weeks old. The first sign of fungal disease in the garden can be when tiny black spots appear on the leaves of the infected rose plant. The spots are soon surrounded with rings of yellow. As the disease progresses, the entire leaf can turn a yellow/pinkish color before it falls off. By summer, untreated black spot can cause the entire rose bush to lose its leaves. Cut any leaf with black spot from the rose bush and dispose of it to prevent new spores from germinating from the diseased leaves. Remove any pruned canes or other garden debris immediately to keep the fungus from moving up to attack the rose bush. Although the black spot fungus can’t survive in the soil, it can survive the winter in dead leaves and other debris in the garden and be ready to attack the new growth on roses when conditions are right in the spring. Without treatment, new spores of the fungal disease black spot can be produced every three weeks. If left unchecked, it can spread throughout the rose garden before the dry heat of summer retards its growth. 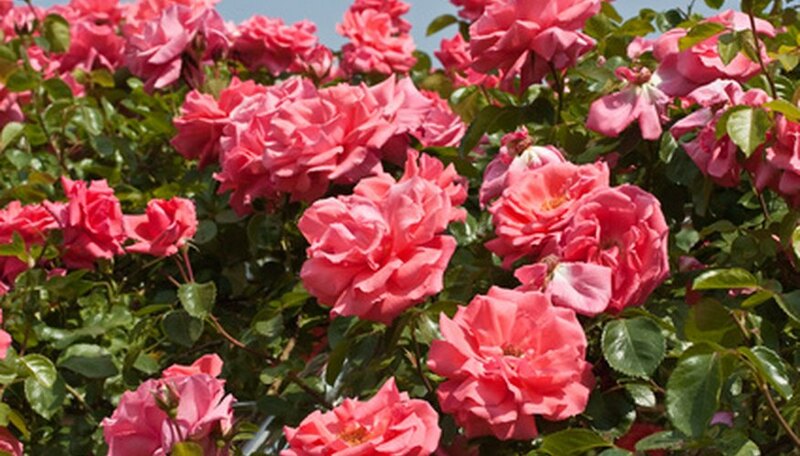 Cut back areas around the rose bush and prune the bush to allow sunlight and air circulation. The quicker the foliage of the rose dries, the less time the fungus has to grow, reproduce and spread. Pay special attention to the canes in the center of the rose bush so that light and air can get through. Traditional fungicides used to treat black spot include those containing captan, mancozeb, Propiconazole, Ziram, trifloxystrobin, myclobutanil, chlorothalonil, Thiophanate-methyl and Triforine. To help the fungicide stick to the waxy rose leaves, a spreader, or adjuvant, is often added. Liquid fungicides work better than dry powders. Apply as directed until dry summer heat stems the growth of the black spot fungus. Then, reapply after a rain. Alternative treatments to traditional chemical based fungicides to help stem the advancement of black spot include lime sulfur, neem oil, hydrogen dioxide, potassium bicarbonate and copper products. These can be applied as a liquid spray.